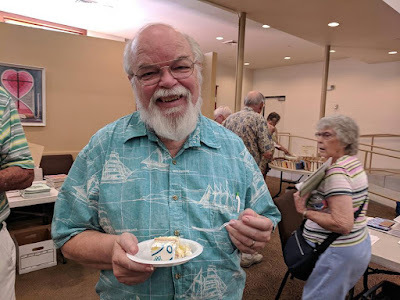 1) Presented "Descendancy Research" and "Discovering George W. Seaver's Life Story" to 92 folks at the San Diego Genealogical Society meeting on Saturday. This was the annual "Ice Cream Social" and 71st Birthday Party of the society. I've been a member for 24 years. 2) Moderated the monthly Chula Vista Genealogical Society Research Group on Wednesday with 11 attendees. In the first hour, I discussed the NEHGS free week, DNA Central, the Ancestry Wiki, Ancestry's new "potential ancestors," the Italy research, and my Newspapers.com finds. In the second hour, the attendees discussed their research successes, challenges, and DNA tests. 3) Transcribed another Henry White deed from Killingly, Connecticut, which I collected at the Family History Library in late February, and used it for Amanuensis Monday this week. 4) Took part in the Mondays With Myrt webinar today. We discussed Myrt's blog post about research notes, her Gettysburg post, "who is your blog audience?," pushing research content out, Pat K's gravestone search, and Myrt's research questions to help her neighbor. 5) Watched two webinars at Family Tree Webinars ("Descendancy Research" by Michael Strauss, and "The Art of Negative Space Research: Women" by Jeanne Bloom) and one on the Virtual Genealogical Society site ("Introduction to DNA for Genealogy," by Randy Whited). 6) Started the presentation for my genealogy research project - researching the ancestry of a local personality, and will present what I find at the CVGS Family History Day in September. I am trying to collect record images for the ancestors, adding source citations and notes to the profiles. I TreeShared once and worked through one session of adding Ancestry Hints to the RootsMagic tree, which has grown to 426 persons with 1284 citations. I still need to go to the FamilySearch Library to find more English and German records for the presentation. 7) There were several sessions working in RootsMagic to update FamilySearch Family Tree profiles for Seaver families and other database families, with occasional additions to the RootsMagic profiles. I have matched 24,678 of my persons with FSFT. I now have 50,328 persons in my RootsMagic file, and 94,907 source citations. 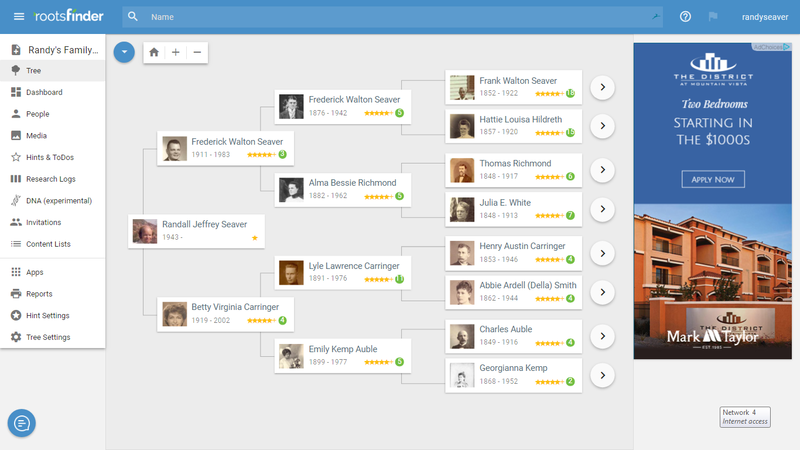 I TreeShared once during the last week, and resolved Ancestry Hints once. I've fallen behind on the Ancestry Record Hints with 68,428 waiting to be resolved, but I'm working on them. 8) Have 292 Shared Ancestors on my AncestryDNA list (I had 292 last week), 924 4th cousins or closer (I had 917 last week), and 836 pages (over 41,800 matches with at least 6 cM) (was 832 pages last week) of matches. I have 20 DNA Circles (was 20 last week). I have 13 matches that are third cousins or closer, and 99 matches with 34 cM (0.5%) or more (was 102 last week). My highest match has 779 cM (11.5%), and is one of my first cousins. My ethnicity estimate has not been modified yet. 9) Have 4,116 DNA Matches on MyHeritage (up from 4,111 last week) with at least 8 cM (0.12%), with 23 matches with more than 34 cM (0.5%) or more (was 23 last week). I have three close relatives, including a first cousin once removed, and two first cousins twice removed. The highest DNA match is 512 cM (7.1%). 10) Have 977 DNA Relatives on 23andMe (I had 981 last week) who share at least 0.10% (7 cM) with me. The two closest relatives are third cousins. Of these, only 3 share 1.0% or more, and 46 share 0.50% or more (was 45 last week), with the highest match being 1.54%. My highest match is an adoptee. I struggle to find out anything about most of these testers. 11) Have 2,694 autosomal DNA Matches on FamilyTreeDNA (up from 2,687 last week) who share 0.25% (18 cM) or more, with the highest match being 96 cM (1.42%). I have 12 who share at least 1.0% (68 cM) with me, and 1,452 who share at least 0.50% (34 cM) or more (was 1,452 last week) with me. 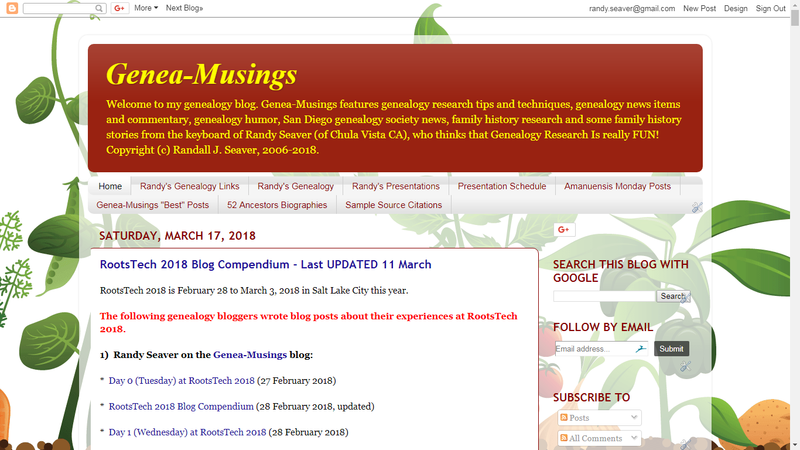 12) Wrote 19 Genea-Musings blog posts last week, of which three were press releases. The most popular post last week was "Genealogy News Bytes - 10 July 2018" with over 378 views.